Almost to the Mississippi River! | NJNA is Blogging! Almost to the Mississippi River! We are moving on! Today we only got to 11 states. Most were easy because the borders are more regular in the Northwest Territory states as well as a few of the southern states. But Florida! Lots of compensation, lots and lots! 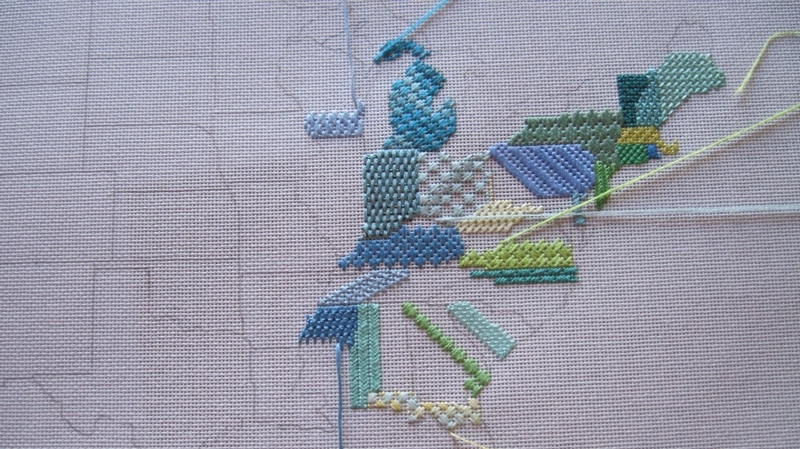 I now have only two blue threads left to use and one state east of the Mississippi to begin, Illinois. You will see quite a few hanging threads left to finish and one more completed state, Indiana. Plus a couple more history lessons–the Toledo War was “fought” in Congress when Michigan was supposed to enter the union in 1835 along with the slave state, Alabama. Ohio congressmen were blocking the admittance because they wanted the city of Toledo on Lake Erie in their state. You can see a jog in the Ohio/Michigan border just for that. Does make it more interesting. One of the women in the class took close up photos of the piece with her iPad so that as she is stitching she can look at a blown up photo of the state she is stitching. this is valuable when you cannot quite figure out how to begin the next row or when you are not quite sure of the location of the border between two states–they are not all straight lines and those rivers do wiggle around! I am glad that we still have two more days of class as I am on a roll, enjoying the teacher as well as my stitching neighbors. Cropped picture would not transfer! Hope to complete some loose threads before class tomorrow!